Balu (Kamal Haasan), short for Balakrishna, is an economically disadvantaged but multi-talented dancer, adept at the Indian classical dances of Kuchipudi, Bharatanatyam, Kathak, etc. His simple and honest soul does not permit him to attain professional success in the commercial world that requires a certain level of moral laxness. Madhavi (Jayaprada), a wealthy young woman and a dance patron, notices his talent and acts as his benefactress, helping him secure his lifelong opportunity of participating in a high-level classical dance festival. Balu's aging mother passes away from the afflictions of poverty two days before the performance. Balu, who was very attached to her, is emotionally devastated. As a result, he fails to participate in the dance festival. Madhavi nevertheless gives him support and encouragement and sets him on the mend. Balu gradually develops a fondness for Madhavi as their relationship grows. He hides his love for her but eventually picks up the courage to express it. Balu discovers that, while Madhavi shares his feelings, she is a married woman separated from her husband. The husband later returns to unite Madhavi and Balu, but Balu decides to sacrifice his love showing respect for the institution of marriage. The years pass, and Balu, a disappointed man, has become an inconsolable alcoholic and a newspaper journalist/art critic. Meanwhile, Madhavi's husband dies, and she hears about Balu's condition. In a bid to revive his will to live and his passion for his art, she tends to his medical needs, through his friend, Raghu (Sarath Babu) and solicits Balu to be the dance master for her daughter, Sailaja (SP Sailaja). The film ends with Madhavi's daughter's stage performance with Balu watching her in a wheelchair, his health having completely deteriorated. While watching the performance, he passes away. Raghu and Madhavi are seen taking him away quietly, without interrupting the performance, back to the hospital. 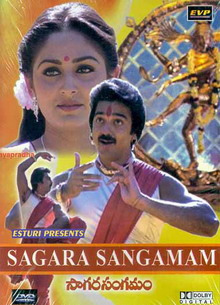 Saagara Sangamam Balu (Kamal Haasan), short for Balakrishna, is an economically disadvantaged but multi-talented dancer, adept at the Indian classical dances of Kuchipudi, Bharatanatyam, Kathak, etc. His simple and honest soul does not permit him to attain professional success in the commercial world that requires a certain level of moral laxness. Madhavi (Jayaprada), a wealthy young woman and a dance patron, notices his talent and acts as his benefactress, helping him secure his lifelong opportunity of participating in a high-level classical dance festival. Balu's aging mother passes away from the afflictions of poverty two days before the performance. Balu, who was very attached to her, is emotionally devastated. As a result, he fails to participate in the dance festival. Madhavi nevertheless gives him support and encouragement and sets him on the mend. Balu gradually develops a fondness for Madhavi as their relationship grows. He hides his love for her but eventually picks up the courage to express it. Balu discovers that, while Madhavi shares his feelings, she is a married woman separated from her husband. The husband later returns to unite Madhavi and Balu, but Balu decides to sacrifice his love showing respect for the institution of marriage. The years pass, and Balu, a disappointed man, has become an inconsolable alcoholic and a newspaper journalist/art critic. Meanwhile, Madhavi's husband dies, and she hears about Balu's condition. In a bid to revive his will to live and his passion for his art, she tends to his medical needs, through his friend, Raghu (Sarath Babu) and solicits Balu to be the dance master for her daughter, Sailaja (SP Sailaja). The film ends with Madhavi's daughter's stage performance with Balu watching her in a wheelchair, his health having completely deteriorated. While watching the performance, he passes away. Raghu and Madhavi are seen taking him away quietly, without interrupting the performance, back to the hospital.. This movie is a gem for two reasons. One, it had popularised the traditional dance forms of India in the telugu speaking land. Two, it is an excellent portrayal of complex emotions like Love, friendship, teacher-student relationship, and above all devotion to art. About the performances, anything said is less. Kamal Hassan and Jayaprada have always received rave reviews for their performances in this movie but another actor who deserves a mention is Sarath Babu. Spell binding performance. Not to forget, Jandhyala's dialogues render life to the characters. This Is Such A Beautiful Film And Although I Keep Returning To It Time And Time Again To Watch The Incredible..